"Luxury can be a dirty sock if dressed up the right way," once said Zac Posen. 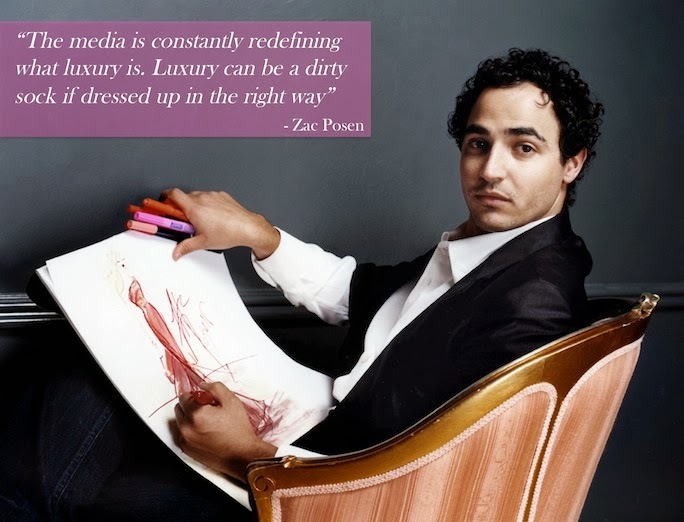 I love this quote, and since Zac Posen is one of my favorite American designers, and it happens to be New York Fashion Week, I thought it was only fitting to feature a nugget of his insight. Although I may not be buying any of Zac Posen's runway dresses, I see a piece from his more affordable line, ZAC Zac Posen, in my closet's near future. He also just launched an exciting new venture which is the first on my list of link loves for this week! Zac Posen for David's Bridal: Yes the rumors were all true. Zac Posen really did design a line of affordable bridal dresses so more women than just movie stars can look like sexpots on their wedding day. Shopbop Sale: Somebody take my computer away because Shopbop has another amazing round of items up to 70% off and my trigger finger is fiending for this Tibi tank. Who wants a ticket to the Alexander Wang show?!?! The editors at Elle know that speed skating may not be everyone's favorite sport, so they put together a little fashion Olympics action of their own! Semi Stalkers Take Note! Check out this handy chart on when its OK to Google a person. For instance: "Are they standing right next to you? That's creepy..."
I love that quote - and I totally agree with him!